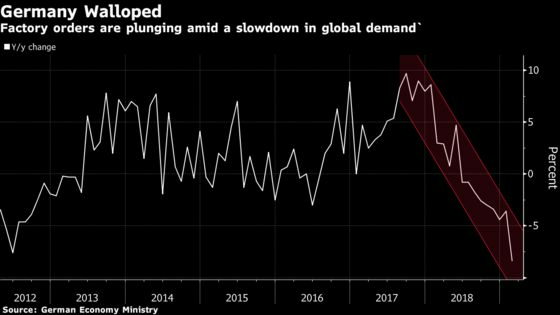 Germany’s painful industrial slump shows little sign of ending, with factory orders plunging the most in a decade in February, led by a drop in exports. The bad news from the Economy Ministry was followed just hours later by new forecasts for 2019 that predicted the weakest growth in six years. The country’s five leading research institutes see expansion of 0.8 percent, just half the pace previously anticipated. The big drag in February was exports, which fell 6 percent. Trade tensions and Brexit woes are two factors likely behind the slump, while there’s also weaker demand, particularly in China, for cars and other German products. A number of companies have cut their 2019 forecasts in response to the slowdown. Infineon late last month cited “continued global economic uncertainties and weaker end-market demand,” and Osram pointed to softening growth and geopolitical tensions. BMW AG warned earnings will fall “well below” last year’s level. The deteriorating outlook for manufacturing is a further warning sign to policy makers overseeing the euro-area economy. European Central Bank officials will meet next week to offer their latest policy assessment. At their update in March, projections for 2019 were slashed by the most since just before the start of quantitative easing, triggering fresh stimulus for banks and a pledge to keep interest rates low for longer.